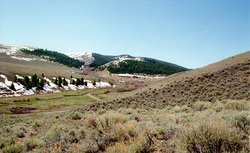 Bannock Pass Ranch is a working cattle ranch, located in a high mountain canyon. Elevation 7,500 feet. Our remote mountain ranch offers completely furnished one and two bedroom apartments with full kitchens and private baths. Guests enjoy hunting, fishing, hiking, ranch activities, etc. We are a great alternative to motels. Accommodations are by the night or week. A color brochure is available. Directions: To reach Bannock Pass Ranch from I-15 north or south take the Clark Canyon Dam Exit #44 and follow Highway 324 south west for approximately 30 miles. When the pavement ends, continue 3 1/2 miles on the gravel road. There will be a school bus turn around at the pole gate with a sign saying Bannock Pass Ranch. Enter the pole gate on the right and bear left. Follow the road for 2 miles to the ranch house.